Bike theft in London is a growing issue. Last year, over 14,000 bikes in London were stolen and many were used to commit further crimes that can often be violent. Since the launch of the campaign, there’s been a significant drop in motorcycle and moped thefts in London by 35.6%, 13,997 (February 2017 – January 2018) thefts to 9,014 (February 2018 – January 2019), due to the hard work of the police and bikers alike; The Met Police are still working hard to stop criminals from doing this by using newer and faster bikes to pursuit, ‘stinger’ devices that deflate tyres and forensic sprays that mark individuals committing the offences in order to arrest those responsible. The Met have already seen a lot of success from these new initiatives being used, they’ve resulted in arrests and prosecutions of those guilty of committing crimes. However, the Met are encouraging bikers, not just in London but all over the country, to step forward and do their bit in protecting their motorbikes. Recent statistics released by The Met (March 2019) show that there’s been a huge fall in motorcycle/mopeds used in crimes as well. There’s been 11,858 less offences during February 2018 to January 2019, compared to the previous year – this is an incredible 48.6% decrease! Although, the numbers are going in the right direction it’s still really important to keep your bike safe and secure. The Met Police are encourage bikers to follow three simple steps in helping to combat theft. LOCK your bike by using disc locks to secure the front brake disc and stop it from being wheeled away and/or grip locks on the handlebars. Always engage your steering lock. You could also use a D-lock on the front wheel. CHAIN your back wheel to street furniture and with the chain off the ground. If not, thread the chain through the frame and back wheel to protect parts being stolen. COVER your bike and make it less attractive to thieves as often they are on the look out for certain models. It is recommended using a quality, professionally fitted Thatcham approved alarm and tracking system to put thieves off and could reduce your insurance premiums. When securing your bike at home it’s highly recommended to keep it in your garage or shed, if you have one. However we know that’s not an option for everyone, so if not park near your home where visibility and lighting are good, or use a Park Mark approved car park. Security marking your bike will make it more difficult for criminals to sell parts on, and therefore less attractive to steal. It will also help police identify parts and return recovered stolen bikes. 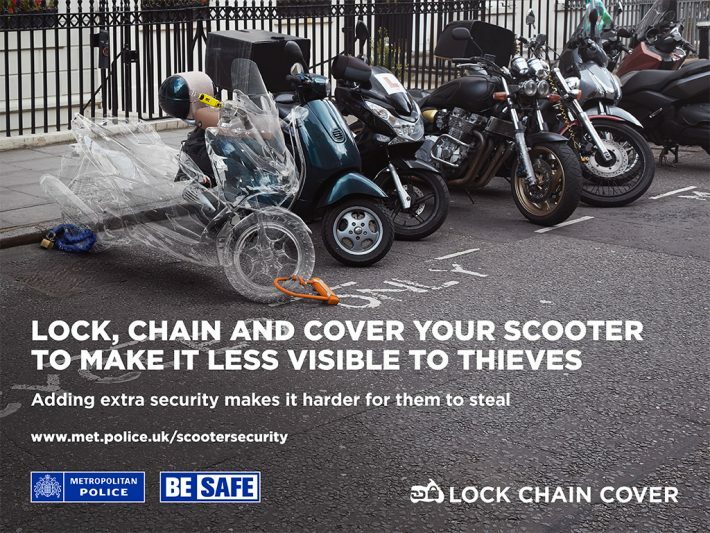 These extra security measures will not only make your bike less visible to thieves and harder for them to steal but you could also help reduce other scooter and motorbike related crimes such as phone snatches. Read more about motorcycle security in our dedicated hub.